Tell your colleagues that you signed & invite them to sign! As businesses and governments automate more of their business and mission processes, the risks to which software-intensive systems expose the organization grows dramatically. In an era of 9-digit glitches (incidents with damages over $100,000,000), senior executives outside IT are held accountable, and some have lost their jobs as a result. Since senior executives are rarely IT experts, they need guidance on how to govern the risks of untrustworthy systems. Signatories indicate their willingness to develop policies and practices within their organizations to support these principles, and to encourage adoption of these principles in other organizations. 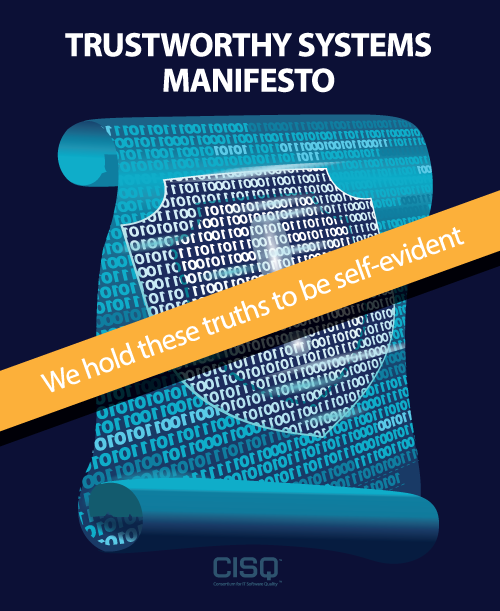 This manifesto is developed and maintained by the Consortium for IT Software Quality™ (CISQ™), a standards consortium managed by the Object Management Group® (OMG®). OMG is a member-driven, not-for-profit IT standards organization. CISQ is chartered to advance the trustworthiness of software-intensive systems by producing standards for automating the measurement of size and structural quality from software source code. CISQ conducts outreach activities to spread measures and techniques for improving the trustworthiness of software-intensive systems.